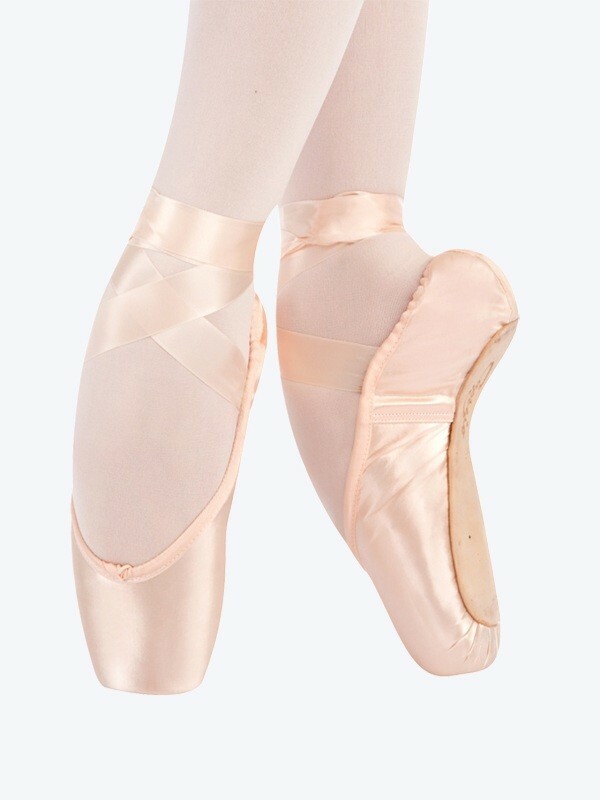 A flattened crown compliments the natural shape of the foot while the satin binding creates a seamless transition from shoe to tight that enhances the leg line and the shorter sole is less visible en pointe. New pleating has "quiet toe" construction and the feathered toe box allows the dancer to relev with ease. 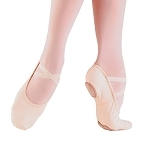 A graduated shank and sole, soft cotton lining and a pre-molded shank offer greater comfort. 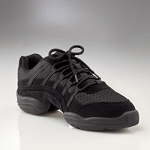 Other features include a slightly tapered toe box, medium vamp, low sides, round shaped throat, a wide and high platform, So Suede lining, elastic drawstring, and a #3 leather outer board shank 3/4 skived to zero. 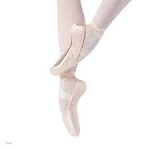 For ribbons we suggest Capezio 7/8" wide ribbon.